From 19 May to 1 June, earn some fantastic Bonus Rewards when up your Street Cred by attaining the titles of 'Urban Hipster' and 'Leadership of Society'! The list of required achievements for each title are listed in your title ‘Collection Book’, by hitting ‘P’ on your keyboard, then clicking on ‘Title’ to bring up ‘Title’ menu, then selecting the second tab ‘Collection Book’. 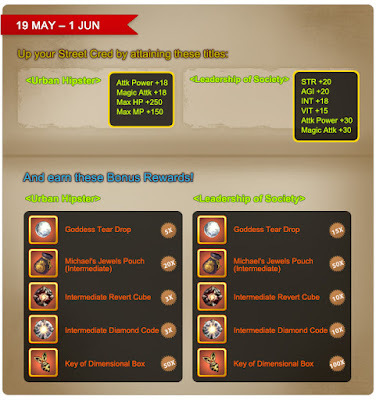 - This event starts on 19 May 2012, 0000HRS (GMT+8) and ends on 1 June 2012, 2359HRS (GMT+8). - Players may choose to obtain either the ‘Urban Hipster’ or the ‘Leadership of Society’ titles or both. Rewards will be given based on the respective titles earned. - Characters which have already attained either or both of the titles beforehand will be automatically eligible for the rewards. 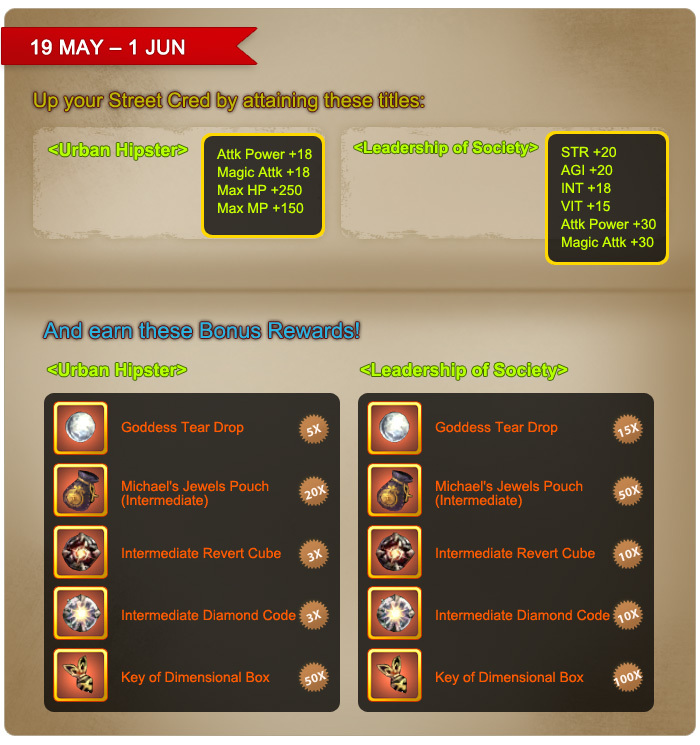 - The rewards will be credited to all eligible characters on 5 June 2012, before 2359HRS (GMT+8). - All Admin decisions are final.